1. Note that the list of “prophets” in this council includes Steve Shultz, Chuck Pierce and Kim Clement — three people I’ve recently written about. Clement has a long list of false prophecies, and all three of them teach the unbiblical doctrines of the apostolic-prophetic movement (read past posts for more information). I plan to discuss the council’s other “prophets” in future posts. 3. The introduction to this “Word of the Lord” has lots of caveats — more than I’ve seen in previous years. Perhaps critics of the movement are having an effect. However, keep in mind a couple of things. First, many of these “prophets” teach that they have the office of prophet and, thus, have the same authority as prophets like Elijah and Jeremiah. So, although they seem to be downplaying their role here, they are elevating it in many of their books and other teaching materials. Also, notice that when you add up all the caveats, you’ll find that not one of the prophecies actually has to come to pass for the prophecies to be accurate, according to these “prophets.” (Read the introduction to see what I mean.) Furthermore, when you read all the prophecies, you’ll see that not one is specific enough to actually be proven true of false. They are so vague and nebulous that many things could be pointed to as their fulfillments. 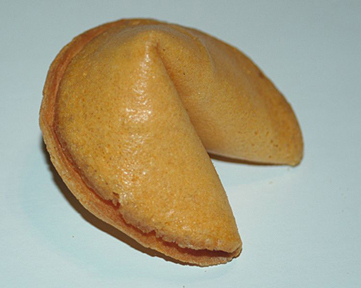 That’s why I call them “fortune cookie prophecies.” Consider prophecy No. 1, for example: “Finishing of a building cycle. Time for new building strategies to be released.” What does this mean? What would it look like if fulfilled? Anything could be made to fit this. 5. Prophecy No. 6 has to do with the “transference of wealth.” According to leaders in the movement, God is going to transfer the world’s wealth from the wicked to the righteous (specifically, the apostles). The wealth will be redistributed under the guidance of the apostles. This will give the Church the resources it needs to establish God’s kingdom on earth. The problem is, this teaching has no basis in Scripture. It’s based on new revelation given by new “prophets,” like members of the ACPE. It’s also based on Scripture verses yanked out of context, like Isaiah 60:5 and 11, which speak of the time after Christ’s return. 6. Note, also, that the “prophets” tells us that 2007 is “The Year of the Clash of the Swords.” “Prophet” Chuck Pierce (pictured here) has prophesied that the Church is currently in a “seven-year war cycle” and that 2007 is the year of the sword. (I wrote about this two posts back.) Where did Pierce get this from? Certainly, not from the Bible. But the fact that the ACPE makes this a major portion of their “Word of the Lord for 2007” shows the weight they give to Pierce’s prophecies that have no biblical basis. 7. I think this warning is humorous: “Watch for the trap of fornication and adultery, and beware of seducing spirits.” Since when did we need a special word to warn us of the lure of sexual immorality? There’s a reason prostitution is called the world’s oldest profession. Of course, we should always beware of seducing spirits. 8. Whatever happened to all the prophecies made in the “Word of the Lord for 2006?” Read it here. I haven’t seen any follow up but, then again, those predictions also were vague, so almost anything could be made to fit them. There are lots of similarities with the “Word of the Lord for 2007,” like predictions of moves of God on university campuses. These are just quick thoughts about the “Word.” Let me know yours. The reason they put out that particular warning is cause so many among their ranks have been brought down by it. From the well known leaders to the little guy in the pew. Men and women alike. Hello Jody: 1 Tim 4:1-5, 2 Tim 4:1-5 come to mind. These people like the catholic church, Rick Warren etc will say anything to look like authorities on behalf of out lord Jesus Christ. The problem most of these, if not all of these people will run into Matt 7:15-29. They most not see the worlds events going on, especially in Israel, which of course is leading up to the greatest event ever that will come upon us shortly The Rapture of us The real Believers Rev 4:1, 1 Thess 4:16-17. We are in the last days, these people will be left behind, and then they will have the false prophet from Rev 13 to work with. Jody, the sad part is that they are so spiritually blinded by their father the devil, John 8:44 that they believe themselves to be true, 2 Cor 11:14. They are decieved and one day they and all their works will be judged, they will give an account for everything Rev 20:11-15. What will they tell The Lord at that time, there will be no excuses and no prophesiesto to see. The Lord has given us the knowledge in The Bible, if they will just read it and repent Matt 4:17 and ask Our Lord into thier hearts John 1:12-13 and Rom 10:9-10. They need to call on The Lord and they will be saved Rom 10:13, they will most likely end up because of thier spiritual pride like the rich man Luke 16:19-31, Matt 19:16-30. These people will get everything yet give up everything Matt 16:26. I would rather have Jesus, keep looking up. What’s going on with Wagner? Another one of these supposedly educated men who has bought in to the Submission Heresy. In the Bible, when Jesus referred to the new wineskins and new wine – he was referring to the New Covenant. That is also what Isaiah was referring to when he recorded “I am doing a new thing.” That sure doesn’t stop these people from making it a catch phrase that applies to every “new” thing they come up with! You’re right about the wineskins. I had the same thought. We shouldn’t be looking for new wineskins because the new wineskin is the New Covenant, which we need to hold tightly to. Thanks for pointing out the quote from the 2006 word about the opposition to the apostolic-prophetic movement. I overlooked that. You can see how they really fear criticism of the movement, and they’re trying to inoculate their followers against it. Of course they are gonna protect their backsides. We shouldn’t be surprised. what really grinds my grits tho..it how pervasive this teaching is and how many forms and models it takes. It sure brings a whole deeper understanding of what it means to walk the narrow way. But we must be couragous and speak up. The church is too timid. Dear Jody and everybody else: Please read NKJV or NIV Zechariah 13:1-5, Verse 3 “It shall come to pass if anyone still prophesies, then his(or her) father and mother who begot him(or her) will say to him(or her), You shall not live, because you have spoken lies in the name of the Lord. And his father and mother who begot him shall thrust him through (kill him) when he prophesies. How long will ye judge unjustly, And respect the persons of the wicked? Selah. (kill him/her) when he(or her) prophesies. We all who are believers understand Rom 8:28, whether they the prophetic movement, want to admit it or not, The Lord is in control of everything and He will destoy them Rev 20:11-15. I hope they will enjoy thier home with thier father John 8:44, 2 Cor 11:14, Rev 20:11-15. John 8:44. This goes for anyone who defends heresy. We are supposed to serve Jesus Christ, He is Lord and Saviour not satan. Rev 20:11-15. “It is a fearful thing to fall into the hands of the Living God” Heb 10:31. All these false prophets need to know is Deuteronomy 18:20-22. Whiffing one rotten egg is more than enough to know that is is rotten. I’m guessing that most of you on here are from the US?? It’s refreshing to see that there are like minded people state side. In the UK while we don’t have so many ‘superstar’ churches or ‘prophetic leaders’ we have a growing movement of prophetic type people that are really into some wacky stuff. The main problem with this movement is that if you challenge it at all you are deemed to be a heretic, I was kind of ostracised for suggesting that some of the activities bordered on witchcraft. My answer is always that the holy spirit is big enough to withstand scrutiny. Also, one thing that I have noticed is that most people involved in this kind of movement are very materialistic and have little or no time for looking after the widows, orphans or matters of justice. If they do it tends to be an afterthought. Here is a website of some people I know here in wales and I was looking for some feedback from you guys, if that’s ok? I’d appreciate your views. Check out my own blog http://www.radicallybalanced.org. It is heartbreaking to see many of my brethren so close to the door, yet so far from the truth. When a person dies, his last words become infamous, important to love ones, or others left behind. The last words that were uttered on the cross by our Lord and savior Jesus Christ were “It is finish.” It is DONE, how difficult is it to understand DONE, or COMPLETE? There is no need to waste your earthly time on weather someone IS, the real question is WHO is you? We are not worthy, may the Lord have mercy. Hi Holly, just wondering if you have since posted anything more on the five-fold ministry – “They sometimes call missionaries and effective church leaders “apostles,” and they call people with the New Testament gift of prophecy “prophets.” ? I tried using the search engine on this blog but could only find this piece.